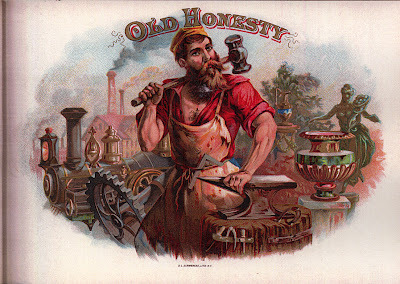 "Old Honesty" is a piece of cigar box art dating from the late 1870s to the early 1880s. It glorifies the "village smithy" of days of yore, from whose honest work all kinds of good things have been produced, from locomotives, pottery, factories, artistic statues, giant cog wheels and even factories. Notice his beard, his manly chest, strong forearms, and the square in his belt and of course the anvil. It was, even for its time, a fond look to a past when a man's labor stood for his honesty and integrity. It was a fond look back because the times were changing so that workers were made to be less important in society, only worker-bees in the factories one can see in the back ground. If you smoked this brand of cigar you were most likely a working man or were delighted with the image the art portrayed and felt a kinship with the icon "Old Honesty" represented.